25 copies in bigger HMVs (seen with my own eyes in B'Ham) and 75 in London according to their computers. Don't pay the extortionate Amazon price that it currently quotes. The digital purchase of just the A-side has been active for a while and the digital B-side will be available when the deluxe album appears next month. The Mporium listing for the album and t-shirt pre-order bundle has been hidden on the site today. The URL still works, but it isn’t on the main site. (also, the very cheap offer of all 4 LIHS coloured vinyls for 40 quid has gone too). 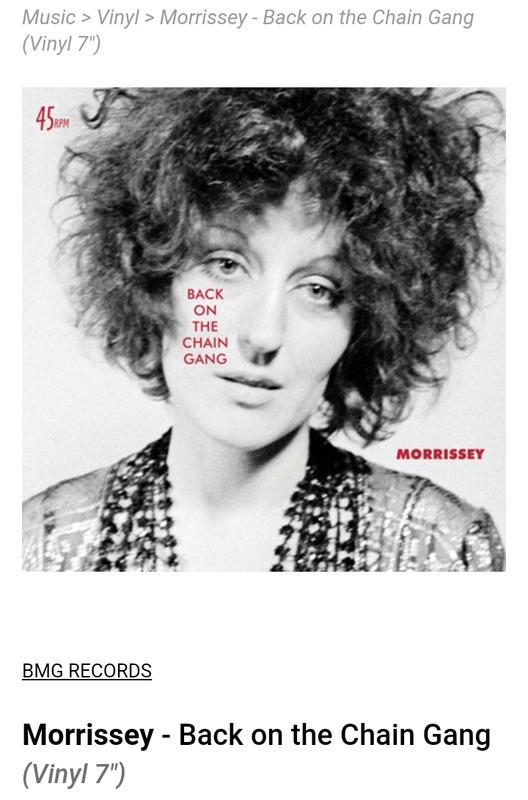 "Morrissey’s new single, Back On The Chain Gang, now has an official release date of November 23rd. Released on BMG Records, the single includes B-side I Didn’t Know What To Do, written and originally released by Gilbert O’Sullivan. 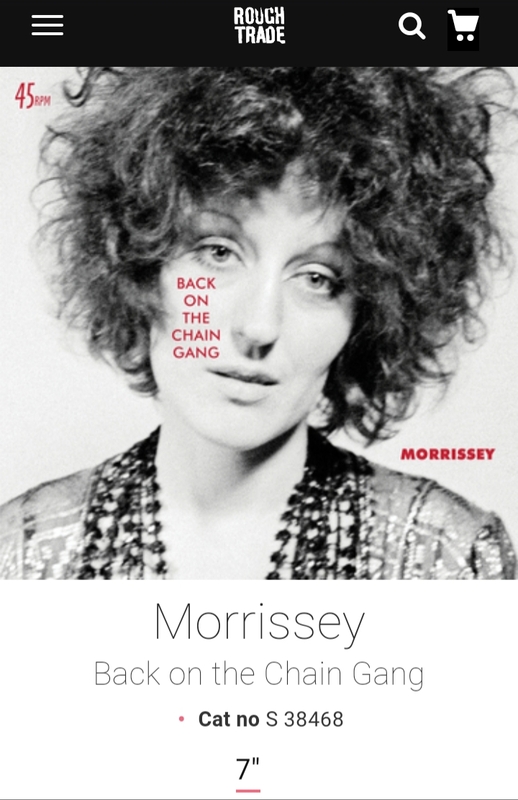 Director Liam Lynch has made a promotional film of Morrissey’s Back On The Chain Gang for anyone, anywhere who wishes to show it"
"Morrissey's Back on the Chain Gang. Available here on 7". As the lead singer of the Smiths, arguably the most important indie band in Britain during the '80s, Morrissey's theatrical crooning and literate, poetic lyrics -- filled with romantic angst, social alienation, and cutting wit -- connected powerfully with a legion of similarly sensitive, disaffected youth. These fans turned the Smiths into stars in Britain, exerting tremendous pull over much of the country's guitar-based music for many years after their breakup, and even if the group remained underground cult artists in the States, they had a fan base that slowly, steadily grew larger over the years." $10.99 via Rough Trade (US).